Yorkshireman Ian Hutchinson is quietly confident he can challenge at the front again this season. Honda Racing’s Ian Hutchinson hopes to banish the memories of a frustrating year in 2018 after vowing to come back fighting this season. The 16-time Isle of Man TT winner was well below his best after struggling with a leg injury following his crash in the Senior race in 2017. Honda Racing's Ian Hutchinson was hampered by injury at the Isle of Man TT in 2018. Hutchinson was a last-minute entry for the North West 200 last May after competing in several club races to gain his licence. He also returned to the TT, although it was clear he was unable to ride at anything like his full potential in his first season on the Honda Fireblade SP2. 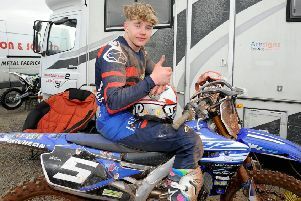 He opted to sit out the Ulster Grand Prix to concentrate on building his fitness for 2019 and the Bingley man has undertaken plenty of pre-season testing, even though his left leg is still considerably weak. Nonetheless, the 39-year-old says he is ‘more excited than ever’ to return to the TT this year and is quietly confident he can repay Honda’s faith in him after he signed a two-year deal with the team in the wake of his latest injury setback. “It’s the usual saying, we’re getting there but it’s been a lot longer than I thought and it has been a really slow process,” said Hutchinson, who was speaking at the official TT launch in Douglas last week. “Even now when I’m doing leg sessions there is still a lot of weakness in the left leg but I’ve been riding a lot on the bike and I’m feeling quite good. In contrast to last year, Hutchinson has adopted a much more hands-on role in terms of machine development during the off-season, to the extent that he joked he ‘may not be the most liked person at Honda’. “The team have put a lot of effort in and I gave them a bit of stick over the winter, so I’m probably not the most liked person at Honda at the moment, but I’ve been on their case every day pretty much,” said Hutchinson, who is the only rider ever to have won five solo races at the TT after achieving the historic feat in 2010. “They have come with the goods and I’ve been out testing and my bike has been absolutely brilliant – it’s a work of art this year and I can see the effort they have put in. Last year may be one he is keen to forget, but Hutchinson has overcome adversity in the past and he is much more confident he will be in a position to produce something approaching his true form this year. “The TT last year was a real strange one for me because I got the cage off my leg about three weeks before it. I never really went into the workshop or asked about the bikes and I just did some club races to get my licence and then we went to the North West and just did my own thing,” he said. “At the TT, I rode around steadily, I pulled in a few times and I was just lucky to have a team that took me on in the position I was in on a two-year deal. “They have stood behind me and given me what I’ve asked for. I’ve a lot of time on the bike and I’ve more track time to come.